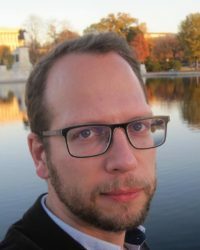 Tamás Scheibner is an assistant professor at the Institute of Cultural Studies and Hungarian Literature at Eötvös Loránd University of Budapest (ELTE). He is also a research fellow at the Institute of History at the Hungarian Academy of Sciences. He holds a Ph.D. in Comparative Literature (ELTE, 2012), and M.A. degrees in History from the Central European University (CEU, 2006) and in Literary Studies (ELTE, 2003). In Spring 2012, he was a postdoctoral fellow at Imre Kertész Kolleg Jena (Friedrich-Schiller-Universität), Germany. In the academic year 2013/2014, he was a Visiting Assistant Professor at Babeș-Bolyai University in Cluj, Romania. As a cultural and intellectual historian, he is primarily interested in the multiple ways culture/literature and politics (or political thought) have affected each other in Eastern and Central Europe throughout the 20th century. His monograph published in 2014 deals with socialist realism and the Stalinization of literary studies in Hungary in the 1940s and 1950s. His current research focuses on the various manifestations of the culture of dissent under State Socialism.